A tender reminder that wild creatures are happiest in the absolute freedom of their native homes. “In wildness is the preservation of the world,” Henry David Thoreau told the citizens of Concord during one of his lectures in 1851. 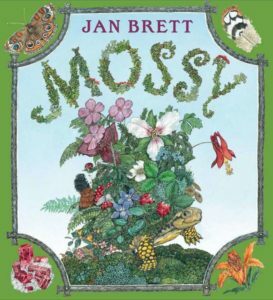 “The most alive is the wildest.” And yet most civilizations inevitably find themselves at odds with nature, a fact that author and illustrator Jan Brett explores in Mossy (public library), a touching children’s book about a turtle named Mossy who is plucked from her native habitat and put on display in a museum. Mossy changes the lives of those who view her, but captivity temporarily changes Mossy’s life for the worse. 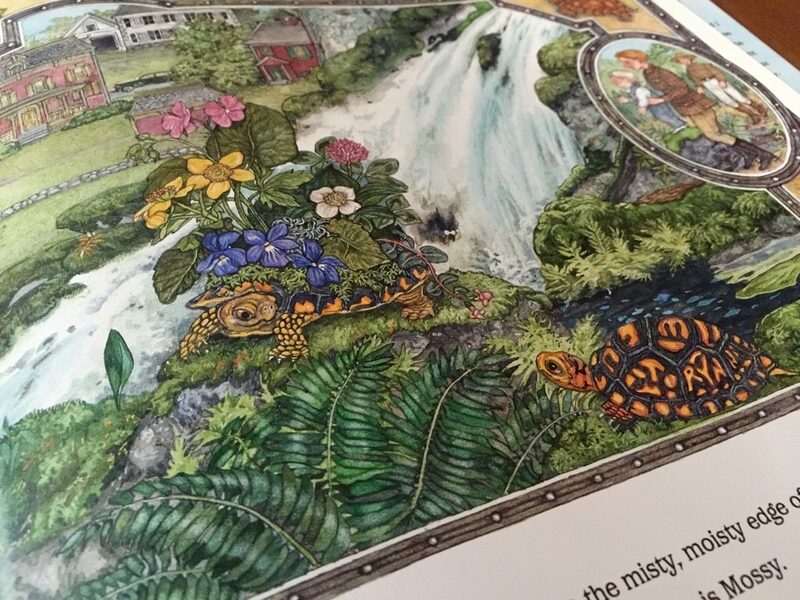 Like many of Brett’s other books, Mossy is full of beautiful, detailed illustrations of the natural wonders present in the Northeastern United States. But it’s the story that packs the real punch by touching on controversial animal welfare issues. Predicated on the radical notion that animals are thinking and feeling beings who have needs of their own, the story suggests that humans should refrain from keeping wild animals in captivity for observation. The thought-provoking subject matter is sure to raise questions. 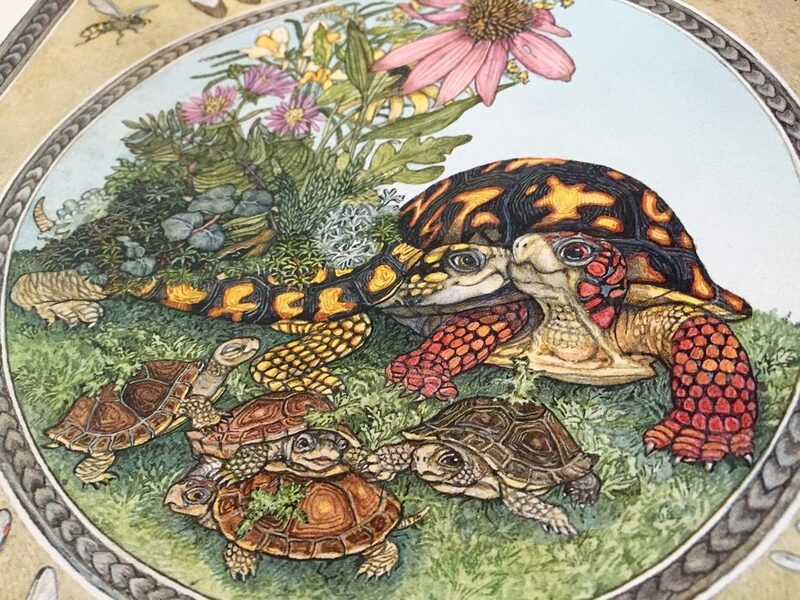 It all starts with Mossy, an eastern box turtle who looks like most other turtles, except for one notable difference: she has a garden full of flowers growing on her shell. On a misty, moisty morning, a young turtle stood at the edge of Lilypad Pond. Her name was Mossy. Mossy liked this damp, cool place. She spent so much time here that curlicues of moss began to grow on her carapace, until her shell was covered with them. As the spring days got warmer, tiny ferns unfurled and wildflowers began to blossom. Soon Mossy’s shell was home to an amazing garden. Dr. Carolina and her niece Tory discover Mossy one morning while they’re out on a walk. Dr. Carolina decides that Mossy would be a perfect addition to her museum. 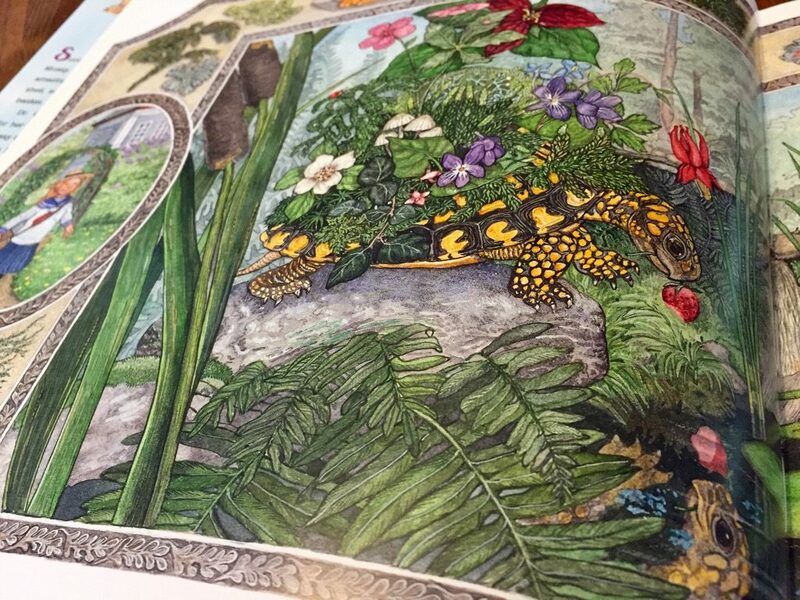 In the museum, they “made a home for Mossy in a viewing pavilion with plants, a reflecting pool and everything they thought a turtle would need.” From then on, Mossy calls the viewing pavilion in the museum home. Mossy is a popular attraction at the museum, but she’s not happy there. She misses Lilypad Pond and her turtle friend Scoot. Mossy was lonely for Scoot. She had stopped looking at her garden in the reflecting pool because it made her remember those ruby-red eyes, shining like jewels, peering at her from Lilypad Pond. Thoughts of Scoot only made her sad. Tory notices that Mossy seems despondent. Things come to a head when Tory asks her aunt whether Mossy is happy in the museum. Tory frowned. She loved the museum. She had helped her aunt collect wonderful things on their walks. But Mossy was the first living creature that Dr. Carolina had taken to live in the museum. Is that why she looks so sad? Tory wondered. ‘Do you think Mossy is happy here?’ Tory asked her aunt. 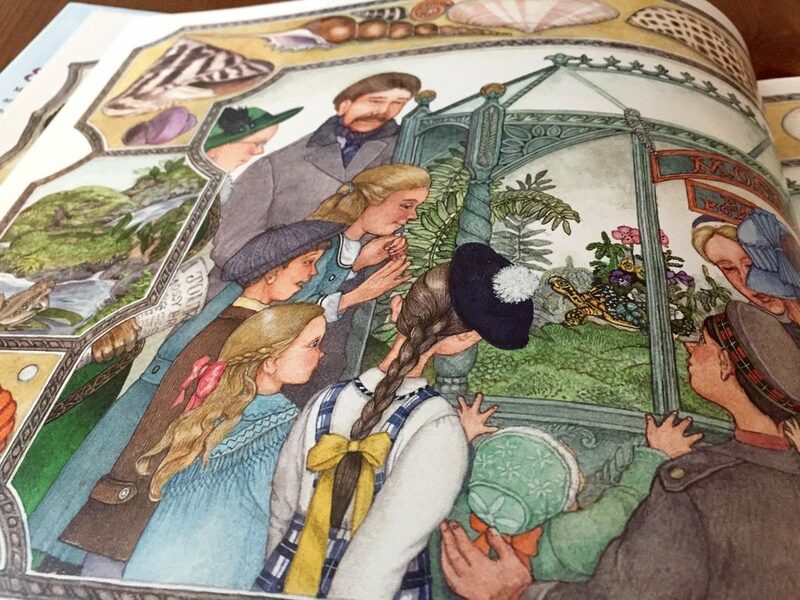 ‘Does she have any turtle friends?’ the children asked. ‘No, but here we all have the opportunity to see her.’ Dr. Carolina paused. The children had given her an idea. 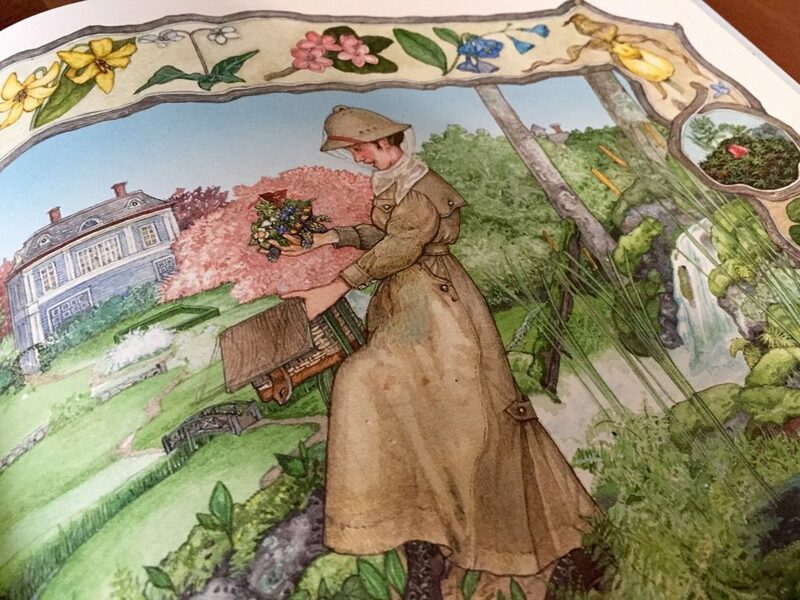 Dr. Carolina decides to take Mossy back to Lilypad Pond, but not before inviting a pair of artists to create a beautiful painting of Mossy for the museum. The artwork of Mossy and her beautiful garden remain on display for all museum visitors. Back at Lilypad Pond, Mossy and Scoot reunite and (ahem) start a family together. On the book jacket, Brett shares how she came up with the idea for Mossy. One summer morning, my husband, Joe, and I were dangling our feet from our dock on Goose Lake. I was watching some waterweeds on the bottom, thinking they looked just like a giant turtle. Suddenly, they swam up towards us. It was a turtle, a huge snapping one, with an underwater ‘garden’ on its shell. That experience gave me the inspiration for Mossy. I chose an eastern box turtle because I wanted my turtle to live on land and grow a gorgeous garden on her carapace. I named her friend Scoot because a turtle’s shell is made up of plates called ‘scutes,’ pronounced the same way. Joe and I thought it would be wonderful to have our own turtle pond. So we built one with rocks for sunning, caves to hide in from predators like raccoons, and water deep enough for hibernating during winter. It has taken time, but finally turtles have found their way to our pond and moved in, joining the first resident, a huge, noisy bullfrog. For readers interested in coloring, Brett has generously created a coloring sheet (also in PDF format) of Lilypad Pond. Brett also has an incredible twenty minute video that provides detailed instructions on how to draw an eastern box turtle. Mossy is an endearing children’s book about love, loyalty, and home. But it’s the story’s underlying implications about nature and our relationship with it that are truly enduring. As civilizations continue to encroach on nature, the story’s message — that wild creatures are happiest in the absolute freedom of their native homes — will become ever more relevant and challenging. Complement it with The Giant Jam Sandwich, a delightful story about an epic battle between humans and wasps.